Omar Lattouf, MD, PhD, professor of surgery at Emory University School of Medicine, has been named medical director of the new cardiothoracic surgical partnership established between Navicent Health in Macon and Emory Healthcare. Lattouf will serve as Vice President for Cardiac Innovation & Outreach. 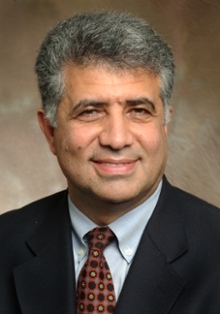 A graduate of Emory University School of Medicine, Lattouf started practicing at Emory in 1985. He is an innovative cardiac surgeon with substantial experience in complex cardiac procedures including heart transplantation, laser re-vascularization, left ventricular reduction procedures and mitral valve repair. "Dr. Lattouf is an outstanding and accomplished cardiac surgeon. We look forward to him joining forces and helping build this exciting partnership with the exceptionally qualified Navicent Health team," says Robert Guyton, MD, FACC, Charles Ross Hatcher, Jr. Professor of Surgery at Emory University School of Medicine. Lattouf will work closely with Navicent Health's current CT surgical team, Peter Bolan, MD, Laura Reed, MD, and James Foster, MD, who have provided a combined 35 plus years of outstanding clinical care to patients in central Georgia. "Dr. Lattouf is renowned as an inventor, researcher and surgeon who specializes in the most difficult cardiothoracic cases. He is also a gifted teacher dedicated to training and education. We believe his addition to our highly skilled Navicent Health cardiothoracic team will lead to wonderful new work within the region, for the benefit of heart patients in central and South Georgia," says Ninfa M. Saunders, DHA, FACHE, President and CEO of Navicent Health. "We are thrilled to have Dr. Lattouf join our team and foresee tremendous benefits for both our physicians and our patients. We look forward to collaborating and learning from Dr. Lattouf as we enhance the excellent care that our physicians have provided to this region for many years," says Bolan. Lattouf recently trained Navicent Health physicians on the new minimally invasive Convergent procedure to treat patients suffering from longstanding persistent atrial fibrillation (AF). The Convergent combines the expertise of a cardiac electrophysiologist and a CT surgeon, and involves the ablation of the inside and outside of the heart to restore regular rhythm. "Our efforts to advance local healthcare capability and access across Georgia and the region will be greatly served by Dr. Lattouf's new role as medical director, leading Emory and Navicent Health's surgical partnership. The people in this region will benefit immensely from his expertise as a skilled cardiothoracic surgeon, physician leader and teacher," says Jonathan S. Lewin, CEO of Emory Healthcare. Lattouf is a widely published researcher and frequent speaker at national and international cardiology and cardiac surgery conferences. He is engaged in active clinical and laboratory research and development work in genetic engineering and stimulated angiogenesis. "I am deeply honored to join this talented team of surgeons and work collaboratively with them to provide life-saving cardiothoracic care to more Georgia citizens," says Lattouf. Throughout his 32-year career, Lattouf has been a vital contributor to Emory's distinguished national reputation in CT surgery. In 1988, he was part of the team performing Georgia's first domino heart transplant; in 1999, he helped implant the state's first Abiomed biventricular assist system to support the failing heart of a patient suffering from post-cardiotomy shock; and in 2001 he performed the world's first totally endoscopic left ventricular resynchronization. Lattouf will begin transitioning into his new role at Navicent Health in early 2018.